Brian was a former mine manager at Island Copper. The mine was in operation for 25 years. Brian is experienced in open pit mines and worked for the Australian company BHP for 30 years. Island Copper Mine was located near Port Hardy at the northern end of Vancouver Island, and at it’s peak, employed almost 1,000 people. The bottom of the pit was 1320 ft deep (below sea level) at the end of the mine’s life. At the time, this was the lowest point on earth replacing the former lowest point which was adjacent to the Dead Sea. 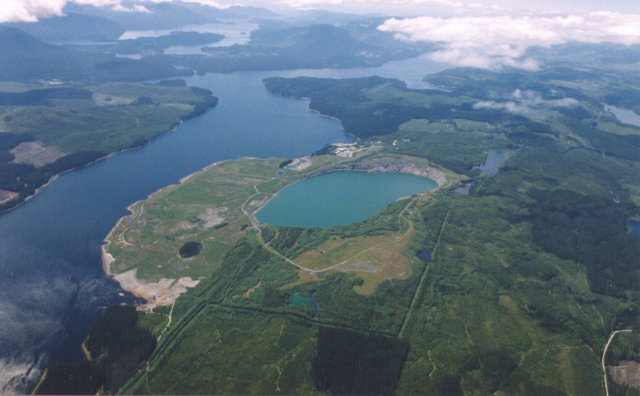 The tailings from the mine were discharged into Rupert Inlet. The mine was particularly close to the ocean and this required the construction of a large wall to maintain the safety of the pit. The pit was flooded at the conclusion of mining in 1996. Environmental monitoring continues to this day, both in the pit and the adjacent Rupert Arm. Monitoring of the inlet has shown that within two years the life of the inlet had recovered to pre-mine conditions, including the crab and prawn populations. The mine produced approximately 30,000 ton vessel leaden monthly with 27% copper. Other minerals extracted included, molybdenum, gold, silver and rhenium, were transported by trucks to market.